With 21 number one hits Alabama was huge in the move from traditional to progressive Country music back in the 1980’s and 90’s. 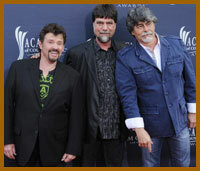 They haven’t played the Houston Rodeo since 2003 and this could be their last appearance. Here's your chance to see the band that ruled the 80s and 90s. 1992: "I'm in a Hurry (And Don't Know Why)"
1991: "Forever's as Far as I'll Go"; "Down Home"
1990: "Southern Star"; "Jukebox in My Mind"
1989: "Song of the South"; "If I Had You"; "High Cotton"
1988: "Face to Face" (duet with K.T. Oslin); "Fallin' Again"
1987: "'You've Got' the Touch"
1986: "She and I"; "Touch Me When We're Dancing"
1985: "(There's A) Fire in the Night"; "There's No Way"; "40 Hour Week (For a Livin')"; "Can't Keep a Good Man Down"
1984: "Roll On (Eighteen Wheeler)"; "When We Make Love"; "If You're Gonna Play in Texas (You Gotta Have a Fiddle in the Band)"
1983: "Dixieland Delight"; "The Closer You Get"; "Lady Down on Love"
1982: "Mountain Music"; "Take Me Down"; "Close Enough to Perfect"
1981: "Old Flame"; "Feels So Right"; "Love in the First Degree"
1980: "Tennessee River"; "Why Lady Why"